Let’s skip the basics of putting your trousers on one leg at a time, shall we, and get down to the important bit. Namely, what you’d do best to deck yourself out in this season. 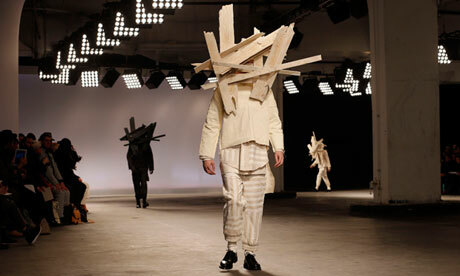 Navigating the post London Collections: Men (LC:M) waters can be tricky fare if you’re not careful and fully prepped. Get it wrong and you could find yourself accessorizing with a crate as a face guard (seven months later and I still don’t get the logic behind that one). Or wearing a backpack with a compass on as Topman decreed for AW/13 back in the January shows . Oh yes, men’s fashion week is even more seasonally out of kilter than the main shows. Thus, some careful picking of your path through the fashion minefield is necessary to ensure you come out looking stylish and not like the main picture on the Topman newsletter- likely appropriating knicker shorts in the summer and looking like the lost member of East 17 in the winter, if the Yeti-come-explorer puffa coat looks of the January shows are anything to go by. If you’re already reading this in head-scratching bemusement, never fear: help is at hand. With a relatively rich history of being snarky about various fashion trends, I feel like I’m just the girl to guide you through, leaving you looking like the true Alpha Male we all know you are.From colour blocking to the beret, this season’s key trends centred around statement dressing (nothing quite makes a statement like a beret, after all). Here are the trends to keep an eye out for. Yup, every season a new colour is crowned the hue to be seen in – the new black, if you will. AW/12’s couleur au choix (fash hack lingo is invariably in French, you’ll find): orange. Not the easiest to pull off admittedly, but as someone who has faced down neons this summer, I have little sympathy. If you feel comfortable enough, try colour blocking. I’d advise choosing different, complementary shades to avoid looking like a traffic cone. If unsure about pulling this one off, take the fail safe option of going for orange accessories – a back pack, an over-zealously tanned date perhaps; much easier way to wear. Alternatively, trousers paired with a plain t-shirt will get you the style points. Bucking the trend to immediately opt for subdued jewel tones the moment the weather makes a turn, this year, bright shades were on the LC:M runways, with everyone from Jonathan Saunders to Katie Eary to Topman Design taking these on for AW. The key to working this one is to try to find brights that announce your entrance, loudly, without making those in the near vicinity want to claw their eyes out at the sight of you. Ease your way in by toning down a statement bright with a neutral piece of clothing. Possibly my favourite trend for the coming season on the grounds of shopping for a winter coat is also likely the one piece in your wardrobe that everyone’s guaranteed to see the most of. Ultimately, it doesn’t matter what you’re wearing underneath because no one’s going to see it, distracted as they are by the brilliant coat you’re wearing (coincidentally my favoured excuse for popping down the shops in old pyjamas). This doesn’t mean you need to go out wearing the fuschia florals of Katie Eary’s collections if you’re not feeling up to the challenge; a tailored classic trench can still pack a punch, especially if you go for one in a bold colour. Burberry’s metallic trenches are a good place to start thinking outside the box. YMC. Agi & Sam. (The coolest up and comers in menswear can surely not be wrong, right?) Well. I mean, I’m sorry, I don’t know how to suggest you wear this without looking like an accompanying roll neck and possibly some spoken word performance pieces. I’m sure there are many distinguished, Les Mis looking gents out there among you who’ll take to this with aplomb. Personally, I’d advise approaching with caution: it could go all so horribly wrong. But hats off to those of you who can do this right.